I’ve been feeling the need to detox a little. Don’t get me wrong, I’m not doing any of that crazy stuff like drinking only lemon juice and cayenne pepper or anything. It’s just that between the long work hours, lack of sleep, some weekend trips, and general meh-ness, I’ve been feeling pretty blah lately. I was browsing Pinterest for recipes and found a bunch of different smoothies, which just struck my fancy for some reason. 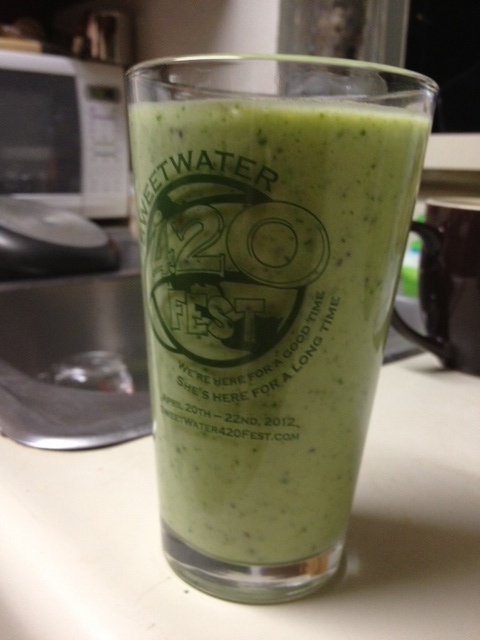 This spinach pineapple smoothie in particular jumped out at me, which is weird because I’ve never had a green smoothie. 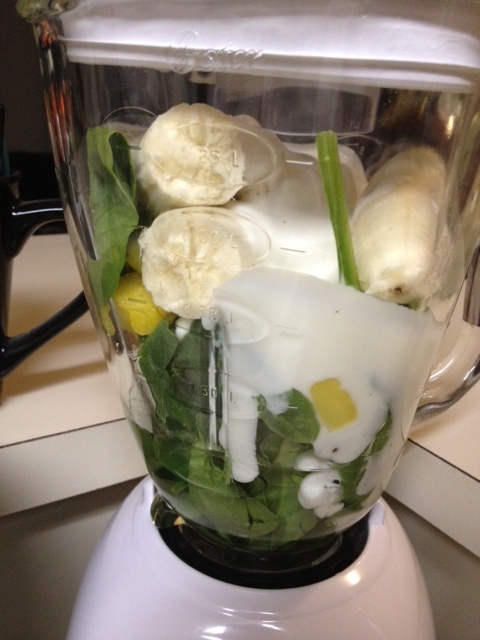 And I know the spinach makes it looks so weird, but it’s actually really good. 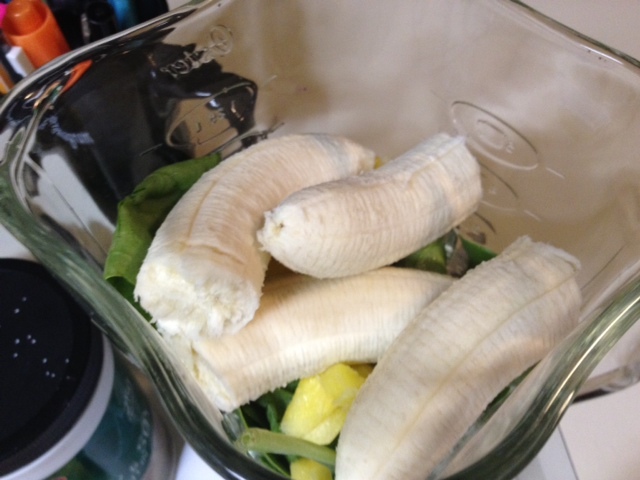 The pineapple and banana are plenty sweet and you don’t taste the spinach at all. So I’ve been drinking it every day for over a week, and am loving it. 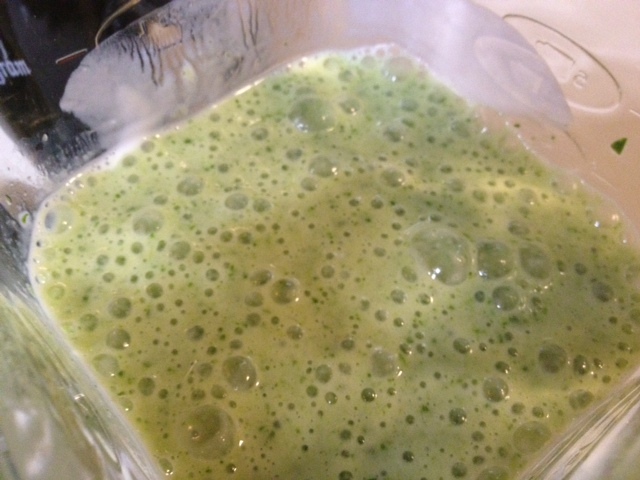 When blended really well, the combination of low calorie foods mixed with fiber and antioxidant-rich ingredients means your body doesn’t need to work as much because the food is already broken down. This allows key nutrients to flood the body better than if the food were eaten whole and separately. Additionally, spinach is a nutritional powerhouse full of vitamins A and K, as well as iron, folate, calcium, and lutein. The pineapple is a vitamin C star, which helps the body absorb the iron in the spinach—which for someone like me who is always low on iron & vitamin C, it’s a 1-2 punch of awesome. Sign me up! 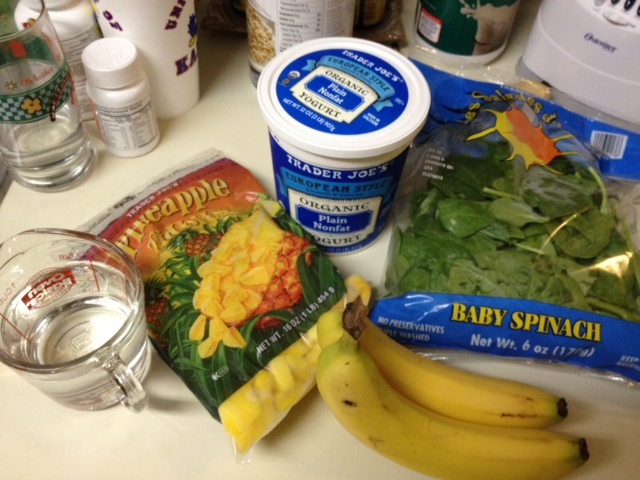 Pretty basic ingredients, although frozen pineapple and baby spinach can be a little on the pricey side. 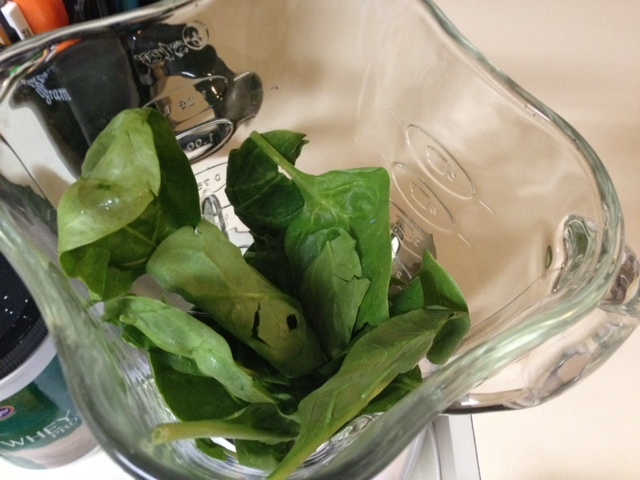 Add 1-2 handfuls of spinach, as well as a cup of water. 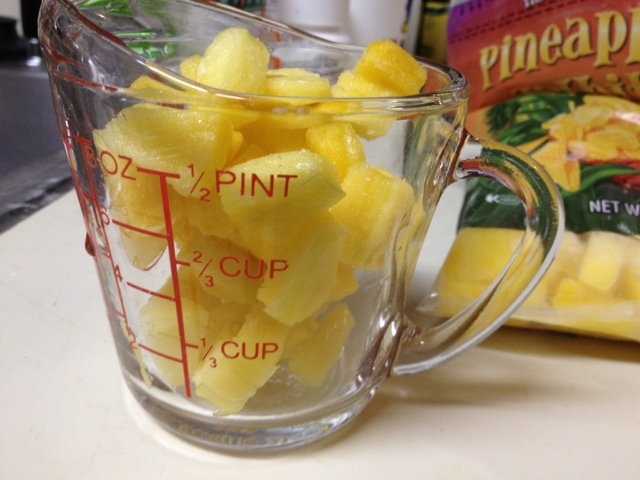 Add a cup of frozen pineapple. Throw in two bananas. I was tempted to try it with just one, because buying enough bananas for a week got kind of crazy! Finally, add a cup or so of plain (nonfat, in my case) yogurt. If you’re using greek yogurt, use a little less since it’s very dense. You could also add a little more water in that case. Additionally, I threw in 1-2 tablespoons of chia seeds for bonus awesome. Blend it up really well, for a minute or so. And done. I’ve had it every morning this week, about half on my way to work and then I stick it in the fridge until about 10:30 for “second breakfast” (a totally legit meal in my world). 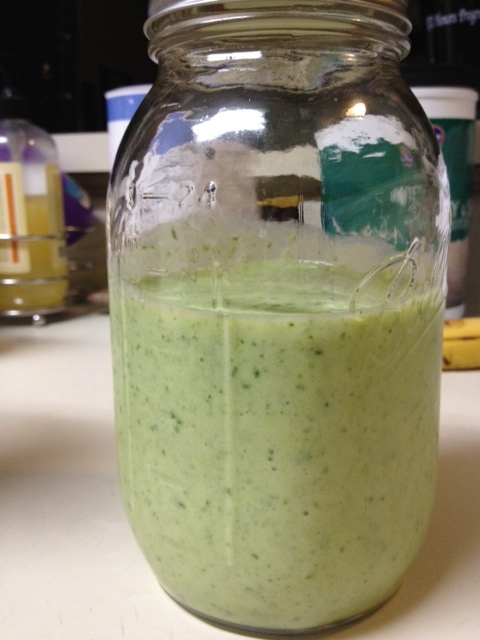 You have no idea how many people have asked me if I’m drinking pesto.